In the history of German politics since 1949 there were quite a few gifted rhetoricians, strong personalities who would shoot any opponents down in flames with quick-witted responses. Among the Social Democrats, Herbert Wehner, Helmut Schmidt and Gerhard Schröder were people of this kind. In the conservative sister parties CDU and CSU, mainly one name comes into one’s mind: Franz Josef Strauss (German spelling: Strauß). Today, things are different. Hardly any high-ranking or prominent Berlin politician has those traits. The exceptions would be Gregor Gysi from The Left (‘Die Linke’) and maybe, to a certain extent, Christian Lindner, the chairmain of the FDP. 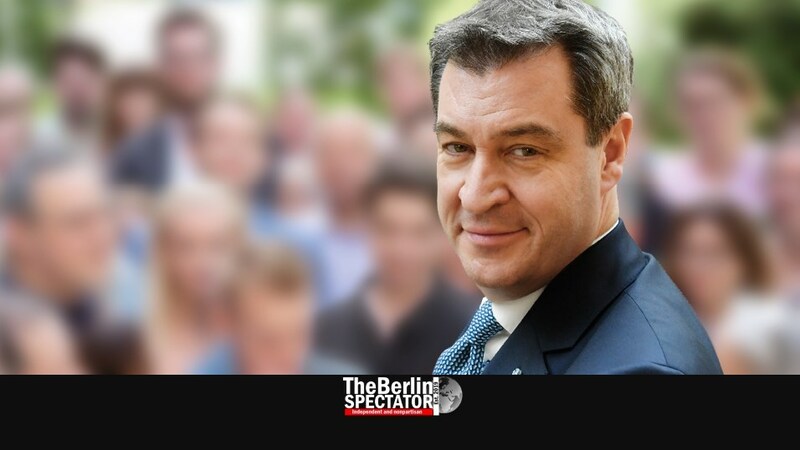 At the federal state level, there is one leader who fits the category well: Markus Söder, the Minister-President (governor) of Bavaria, who is about to be elected chairman of the CSU as well. He is already one of the most powerful conservatives in the country. This will apply even more once he gets elected this Saturday. As an adolescent, Söder was a big admirer of Strauss, who was something like a Bavarian father figure on an overdose of Red Bull. His supporters idolized him, many still do, in spite of the fact that Strauss was responsible for a long list of scandals which rocked the still relatively new Federal Republic of Germany in the 1950-s, 60-s and 70-s.
Strauss was suspected of accepting advantage several times during his long career. But none of those accusations ever stuck. The ‘Starfighter Scandal’ did hit him though, when Strauss was Defense Minister. So did the ‘Spiegel Affair’, a test for the then young Western German democracy, caused by Strauss who had to leave Bonn and return to Bavaria. Markus Söder had a big Strauss poster on the ceiling of his bedroom when he was a teenager. “When I woke up, I looked at him.” Söder did admit that it was not easy when his girlfriend spent the night with him, because she would see Strauss as well, the minute she opened her eyes in the morning. Armed with an excellent Abitur grade (A-Level or high-school diploma), Markus Söder studied law and became a trainee at Bayerischer Rundfunk, the Bavarian division of the nationwide ARD radio and TV network, meaning he was on the other side of the microphone and the camera, decades before becoming a politician, one who knows how to make an impression in front of cams and mics. Early on, he became a member of the CSU and its youth organization, which he led for eight years. With his rhetoric gift and sharp mind, he convinced many party friends and climbed up the ladder. Soon he would be part of the CSU’s leadership and got several minister posts in Bavaria. Then he was his party’s Secretary General, a job which gave him nationwide attention too. It’s not like Söder was always loved by all party colleagues. Some criticized his “politics style”, others accused him of concentrating on populist subjects too much. Also he disgruntled more moderate CSU members by defending ultra-conservative positions. For instance he suggested Germany’s national anthem should be sung at schools more, because this would help with the integration of immigrants. In an interview he once suggested the crucifix should be visible at schools rather than the hijab. During the peak of the refugee crisis in 2015, he called the fundamental right to apply for asylum into question. Just before his first election as Minister-President, Söder first tried to sound at least as firm on immigration as the right-wing party AfD. When he noticed that approach did more damage than good, he reversed course. His CSU then took a big hit in the elections. But he could not really be blamed, at least not alone, because of the general trend in Germany, where the very left and the very right are becoming stronger while the big-tent parties are in trouble or already drowning, like the SPD. Markus Söder, who just celebrated his 52nd birthday a few days ago, will reach his long-cherished goal this Saturday. He will finally have the maximum amount of power anyone can have in Bavaria. Even though today’s CSU chairman, Interior Minister Horst Seehofer, and Söder himself keep on repeating they had gotten along with each other quite well, they did not. For a long time, there was some kind of a feud between the two. At times they cooperated, e.g. when they endangered Chancellor Angela Merkel’s coalition government, a few months back, with their rather stubborn position on immigration. But Markus Söder finally won. When Seehofer announced he would give up his party chairman post, Söder did not even have to fight in order to become his successor. His people at the Munich state parliament asked him to take over. At the CSU’s party convention, which is taking place at a former monastery right now, Söder is about to outline his plans, his vision. The latter includes national level politics too. For instance he wants to save the entire auto industry and in particular the Diesel engine after the Diesel scandal. His party colleague Alexander Dobrindt, the Minister of Transport, has not managed to come up with a sustainable solution to several issues yet, thanks to the auto industry. Söder says he wants unity in his party. Does he mean people should shut up, listen to him and approve everything he says? Not officially. But his claim to power, backed by the two powerful posts he will now have, and combined with his approach so far, suggest this is how things might now work under Söder. He also wants to place more than just immigration in the center of the discussion in his province. Söder is known for being an environmentalist. Several times he said he wanted to be “greener than the Greens.” Stability, politically and economically, is something he wants as well. Now the CSU even wants to approach the LGBT community. This is almost sensational since they are not exactly known for a lot of tolerance here. The CSU wants to get back into the 40 to 50 percent range at elections. If any party in Germany or in any German province might actually achieve that goal again, it is the CSU. While big cities in Bavaria, such as Munich, are being governed by the Social Democrats, the province as a whole has been ruled by the CSU since 1957, without interruption. At times they needed a junior partner for a coalition. Regarding the radical AfD, Söder’s approach is to “make very clear what they actually want”, he says. “Their Dexit (Germany exiting the E.U.) discussion is not theoretical. This is about dividing the continent in its center.” The AfD wanted to harm both Europe and Germany, he said in interviews. With Söder’s election there will be three ‘freshmen’ among powerful conservatives in Germany. There is Markus Söder and there is Annegret Kramp-Karrenbauer, the new CDU chairlady who might easily become chancellor within the next two years. Also there is Manfred Weber, the EVP’s parliamentary party leader in Brussels. In May, he wants to succeed Jean-Claude Juncker as President of the European Commission. Weber is a CSU member, one of Söder’s people. Just days ago he was endorsed by the CDU as well. It remains to be seen how the three will cooperate, how the CSU in Bavaria will do under Markus Söder and how the European election in May will turn out for them.